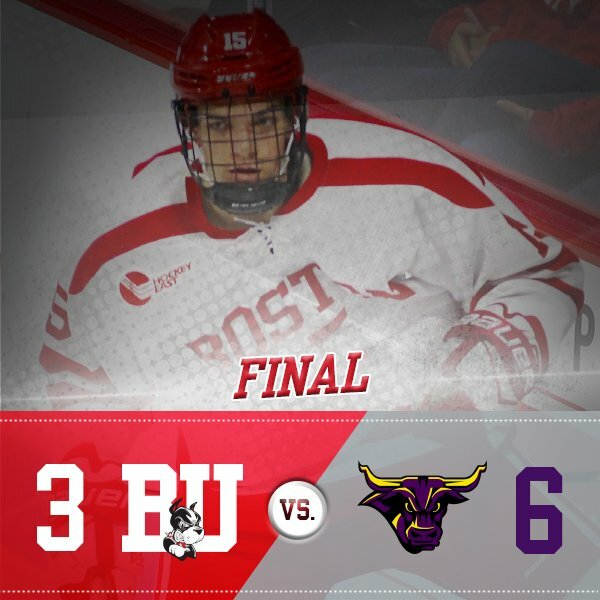 Three second-period goals enabled visiting Minnesota State to pull away from the Terriers en route to a 6-3 win at Agganis Arena. With the score tied at two apiece after one period, the Mavericks dominated the next 40 minutes, outshooting BU 35-24 in the second and third, and 45-35 overall. A trio of freshmen gave BU an early lead on a power play goal when Hank Crone’s centering pass was tipped by Brady Tkachuk to Shane Bowers who rapped the puck past former Terrier goalie Connor LaCouvee. After Minnesota State tied the score on its own power play goal, BU capitalized on another man-advantage. Junior Jordan Greenway batted classmate Bobo Carpenter’s deflection attempt out of the air with sophomore Chad Krys also assisting. Then late in the period, after a BU turnover, MSU’s Daniel Brickley blasted a shot off the crossbar and into the goal to make it 2-2. The Mavericks scored three times in the first 15 minutes of the middle period with Brickley picking up his second and third assists of the game, to claim a 5-2 lead. Bowers cut the margin to two late in the period with assists from Tkachuk and senior captain Brandon Hickey. In the final period, Minnesota State dashed any hopes of a Terrier comeback with an even-strength goal at 9:31. Sophomore Jake Oettinger turned aside 39 shots, while LaCouvee stopped 32 BU shots. "Really disappointing. For the first ten minutes, we actually played well, and after that it's like we completely changed our mindset and lost focus. For the next 50 minutes, they played men's hockey and we played boys' hockey. 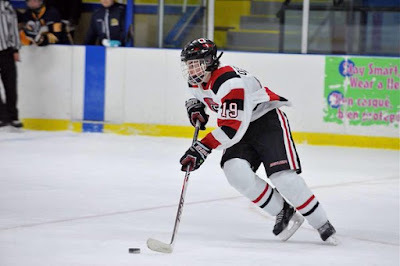 2018 recruit Jack DeBoer scored twice for the NTDP U18s who fell to Miami University, 7-5, at USA Arena in Plymouth, Michigan. The 6’2” center opened the scoring midway through the first period on a one-timer. On his second goal, just a minute into the third period, DeBoer, son of San Jose Sharks coach Peter DeBoer, converted a cross-ice pass from 2018 recruit Joel Farabee to knot the score at 5-5. Tyler Weiss had assisted on the U18s second goal. A fourth 2018 recruit, Jake Wise, is on the injured list with a broken collar bone. 2018 recruit Matthew Quercia assisted on a pair of goals for Sioux Falls in the Stampede’s 7-2 win against Omaha. 2018 recruit Ryan O'Connell (photo) set up the overtime game-winner for Penticton as the Vees edged Merritt, 3-2, in BCHL action. The 6'2" defenseman from Gloucester, Ontario has five assists in six games. Jakob Forsbacka Karlsson scored his second goal of the season in the AHL Providence Bruins’ 3-2 win against Springfield.